Many people get bored of Minecraft Pi edition very soon. Unless they like the coding side of mcpi (Minecraft pi), they usually get Minecraft PC instead. But, I managed to edit the game code so that it is Survival! The licence says, though, that I cannot redistribute the mcpi source code. There is a solution. Somebody else has made a mod that turns mcpi into survival [ilink url=”https://www.dropbox.com/s/iutdy9yrtg3cgic/survival.bsdiff” style=”download”]here[/ilink]. After doing this, you can type ./survival to run survival on your raspberry pi. There are a few glitches, but it is almost exactly like the earlier versions of survival on Pocket edition. But, after doing this, you will find that when you create a new map it is creative (it only has daytime). You still have lives and other survival things, but it is not full survival. To change this, you need to download a minecraft pe 0.6.0 – 0.8.0 map and install it. 0.7.0 + maps may have chests that will crash the game, though. The way to install custom maps is: Go to your downloads folder (usually /home/pi/Downloads) and find the zip file for the map you downloaded. Right-click on it and choose “Extract To…”. Type in “/home/pi/.minecraft/games/com.mojang/minecraftWorlds” If you have an earlier version of minecraft pi (0.1.0) then type in: “/home/pi/mcpi/games/com.mojang/minecraftWorlds”. Then click Extract. A window showing the progress of the extraction should appear, and then close. When it closes, the map has installed! The Underground and prisonEscape do have chests that will crash the game, though. A simple way to test if a map will work with mcpi is to see if it has a “chunks.dat” file in it. If it does, it will work. (if it does not, then re-download the map and try again.) Otherwise, it will not, no mater what you do. Another thing is that you can get skins, texture packs and… mods? Personally I have never tried mods. Some people say, though that some mods for pocket edition work, but others don’t. Texture packs for Pocket edition 0.6.0 – 0.7.0 and pc 1.3 are compatible, but may cause some objects to have slightly wrong images. Most skins work with mcpi. They can even be used on creatures; Skeletons, Creepers, Zombies etc… I have made some custom skins that turn all mobs into robots. A good place to find skins and maps is: [ilink url=”http://www.planetminecraft.com/”]http://www.planetminecraft.com/[/ilink]. Only the skins and texture packs for minecraft 1.3 or less work with minecraft pi. The survival mode mod is legal. The licence says that you cannot re release mcpi, but you are allowed to mod it. Mods can be released, and this is just another one. The coding still works with the survival mod on, so if you get annoyed with it, or if you like coding, then you can still use it. 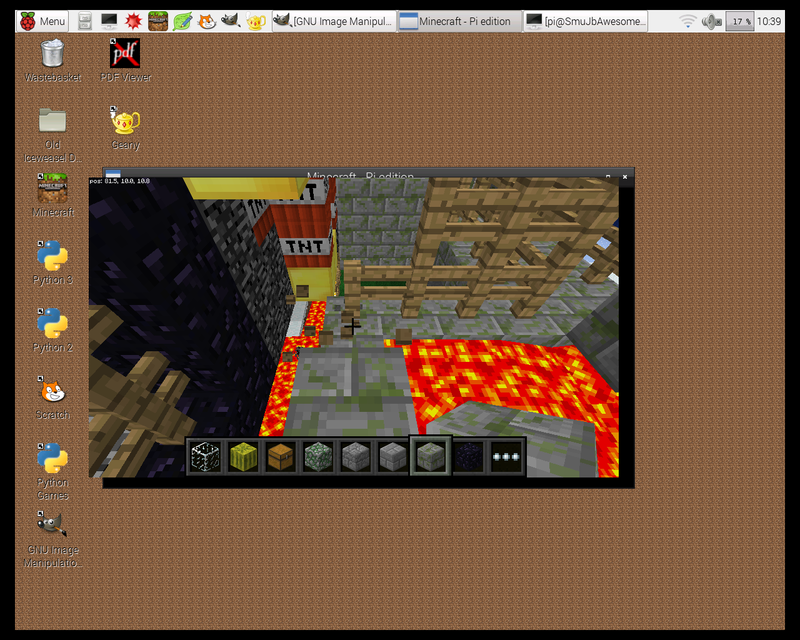 By typing ./minecraft-pi you can also run the creative version. You can do many things that you can do in normal minecraft (burn, die, use nether reactors, blow up tnt, craft things, use crafting tables, stoves etc…). You cannot post to chat or kill creatures, however. I have made some programs that allow you to kill creatures and post to the chat, and they will be downloadable soon. Awesome! Thanks so much for doing this and sharing with the community. I teach coding with Minecraft Pi, but it’s true that it needs a little something! Thanks for visiting our site! I am hoping to be uploading more posts to do with minecraft pi edition including ones on hex editing, more complex programming, and custom maps. Hope to see you again.